Yep, you read that right: I don't own a cell phone. Obviously, I'm no Luddite--so what's the deal? Well, it all comes down to the fact that I need a landline in order to bring home the bacon. (Actually, it's probably more accurate to say I bring home the Bac-O-Bits, as I'm hardly rakin' in the dough as a freelance writer.) Oh, and I'm too cheap to own both--so for the time being I'm a landline-only kinda guy. Anyway, if I had a cell phone, it'd probably be an iPhone. 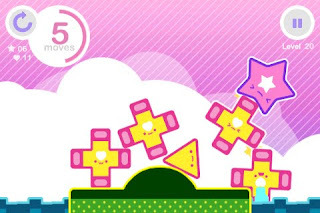 And if I had an iPhone, I'd definitely buy Tumbledop, a cute-as-all-get-out puzzle game that hit the App Store late last week. Thankfully, Tumbledrop is playable on a PC, too. (Check it out here if you're cell-less like me.) That said, I'd still rather play it on an iPhone (or iPod touch).